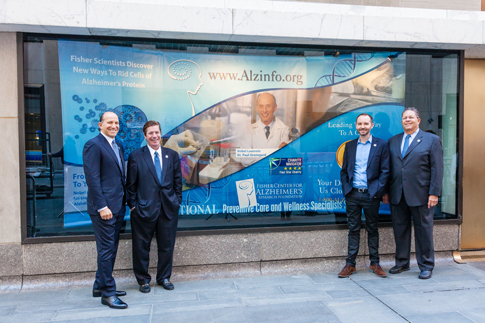 NEW YORK, NOVEMBER 3, 2015 – A window display at Rockefeller Plaza this month, donated by EHE International, featuring the Fisher Center for Alzheimer’s Research Foundation, will reach almost 250,000 people per day with a message about the need to raise funds to find a cure for Alzheimer’s. “Continued and increased funding from organizations and individuals has given the Fisher Center scientists at The Rockefeller University the ability to conduct groundbreaking research and most recently, identify a protective molecule that could pave the way for new Alzheimer’s treatments,” said Kent L. Karosen, President/CEO, Fisher Center for Alzheimer’s Research Foundation. “We are thankful that EHE International has provided the Fisher Center with a forum to share our important message with the public,” said Karosen. The window display encourages people to learn about the innovative research the Fisher Center is funding and directs the public to visit www.ALZinfo.org to donate for the cure. “EHE International is proud to make this gift to the Fisher Center for Alzheimer’s Research Foundation to show that, together, we have the power to end Alzheimer’s,” said Deborah McKeever, President of EHE International. Since 1995, when Zachary Fisher and David Rockefeller joined forces to found the Fisher Center in honor of Zachary’s wife Elizabeth, the Foundation has given tens of millions of dollars to support research in the quest to find a cure. The Fisher Center for Alzheimer’s Research Foundation is a 501(c)(3) that funds research by a team of dedicated scientists at The Rockefeller University as well as NYU Langone Medical Center. The Center is led by Nobel Laureate Dr. Paul Greengard, recipient of multiple awards and honors throughout his career, and includes a research team of world-renowned scientists. 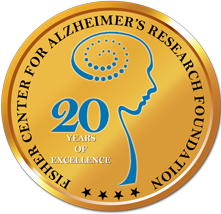 The Fisher Center also provides numerous resources, now available on the organization’s dynamic online platform, ALZinfo.org, for those affected by Alzheimer’s. “We are grateful to the Fisher Center for supporting our research for the past 20 years and are looking forward to future discoveries to find a cure for the 30 million people who live with Alzheimer’s worldwide,” said Nobel Laureate Dr. Paul Greengard, Director of The Fisher Center for Alzheimer’s Research. To hear from Nobel Laureate Dr. Paul Greengard himself, visit Reddit.com on Thursday, November 5 from 12:00pm to 1:00pm ET to submit your questions. Led by President and CEO, Kent L. Karosen, the Foundation was established in 1995 by Zachary Fisher to primarily fund the work of the scientists at the Fisher Center for Alzheimer’s Research at The Rockefeller University. The Foundation has received the exceptional 4-Star rating from Charity Navigator for the fourth consecutive year. 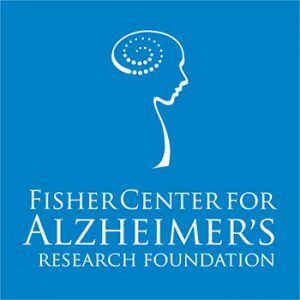 To learn more about the Fisher Center, visit www.ALZinfo.org. To join the conversation, like us on Facebook and follow us on Twitter at @FisherCenter. EHE International is celebrating over 100 years as the recognized leader in preventive medicine with the release of a new book, 100 Years of Preventive Health: The History of EHE International. 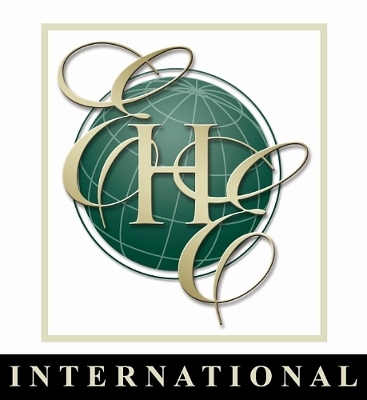 Established in 1913, EHE International is America’s largest and most experienced preventive medicine specialist and the preferred choice among employers for the prevention and early detection of disease and associated risk factors. For more information, contact EHE International, 10 Rockefeller Plaza, 4th Floor, New York, New York 10020; 212.332.3700; visit www.eheintl.com.